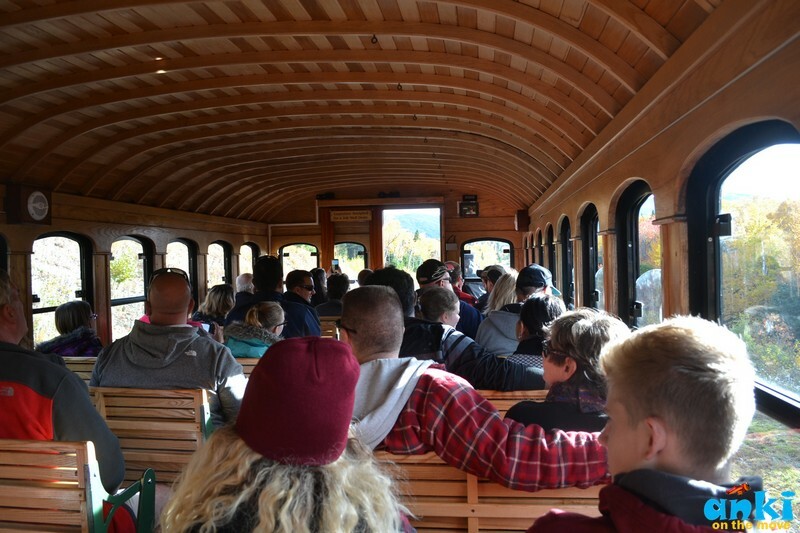 The front of the coach was 14 feet higher than the back of the coach, we were on the maximum grade of 37% inclination and was on the world’s first mountain-climbing cog railway. The moment I stood up I could feel how slant the rail was heading towards the summit, and then I saw my seats, how could I not feel that all the while sitting. The seats were slant too and why because when the rail is steep, you are in a perfect comfortable seating. 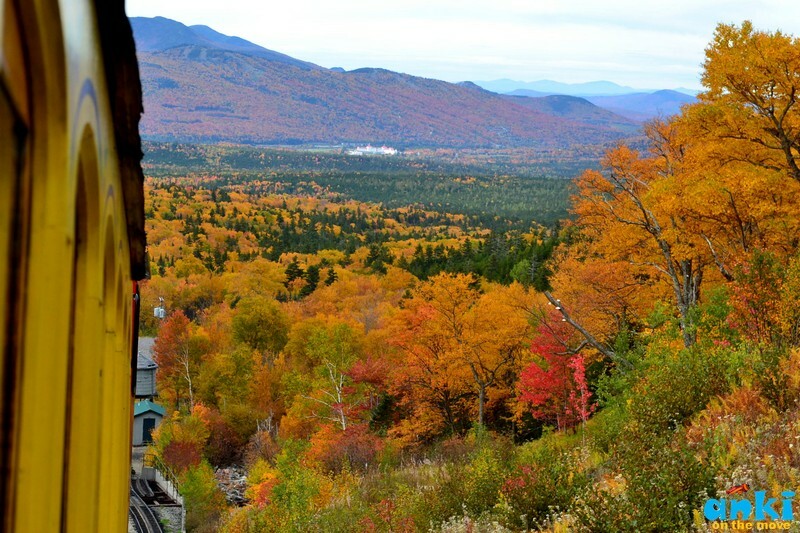 Engineering marvels has always fascinated me and the weekend of Columbus day was when we got an unparalleled view of mountains and valleys during peak fall foliage in New Hampshire. 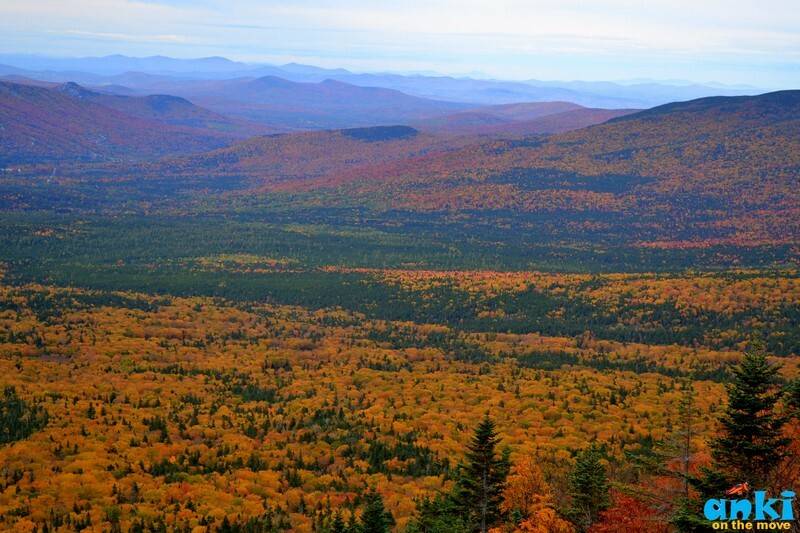 In fact, there were several mountains covered in deep red foliage which I had never seen before. Some were in yellow. Some in green still. The colors were magnificent in deep strong hues. Mount Washington Summit where our rail was heading to is said to have the worst weather in the world. We were silently praying that no fog hugs us as we get down as then, we would not be able to see the spectacular panoramic view spanning the mountains and valleys of New Hampshire, Maine and Vermont, north into Canada, and east to the Atlantic Ocean. At night, you can even see the glow of Boston and Montreal. 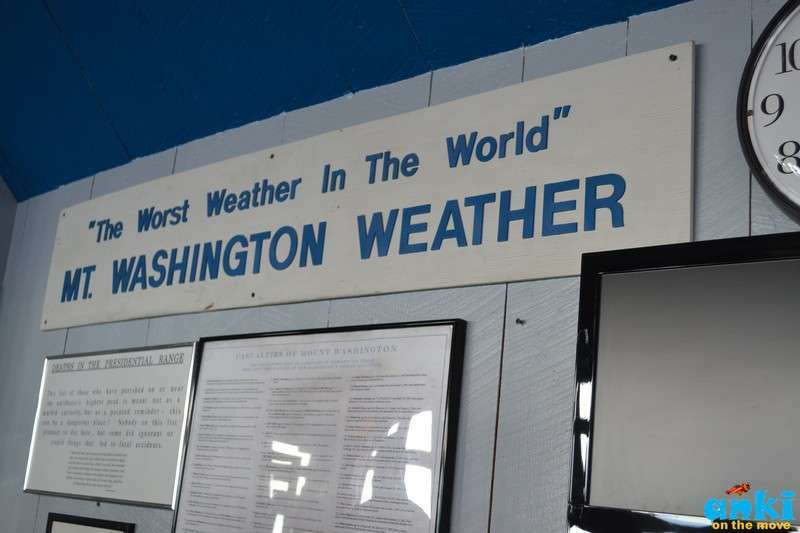 In 1934, Mount Washington recorded a world record wind of 231 miles/hour. The heavy chain that secured the original observatory to the summit was heard to rattle and moan. Mount Washington has earned the reputation of home to the world's worst weather due to persistent combination of bitter cold, dense fog, heavy snow , abundant ice and relentless wind. At the highest point in Northeastern US, and located at the confluence of three major storm tracks, it is walloped by weather. 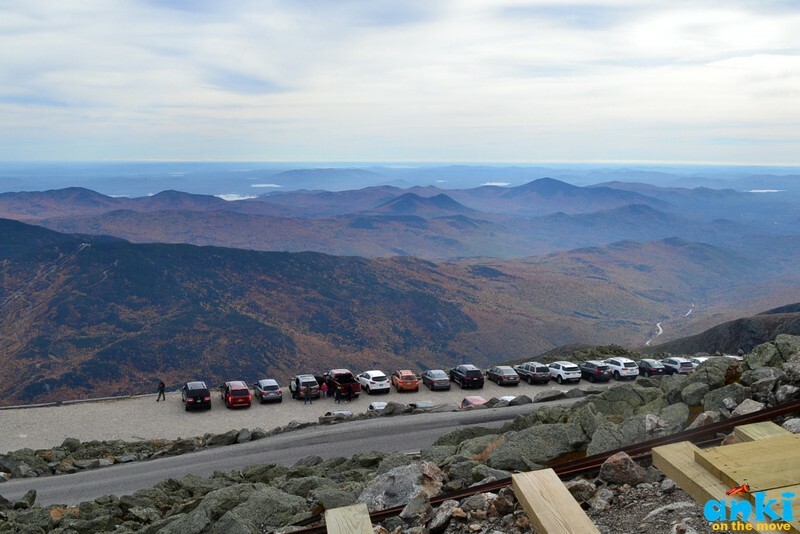 Mount Washington is also listed in the list of America's Top 50 scenic views. 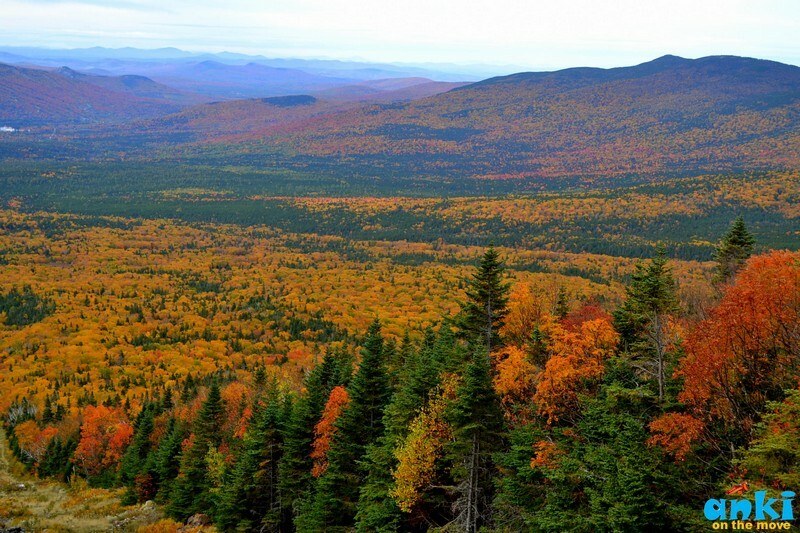 Mount Washington was also called Agiocochook by native americans meaning the place of the great spirits. 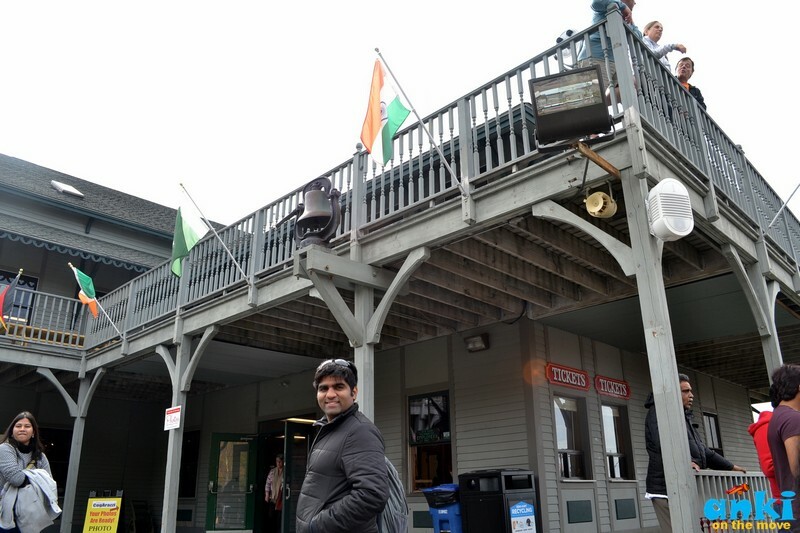 We had started at 1 am from New York area on Saturday and it took us 8 hours to reach the Cog Railway station that includes our 1 hour halt for breakfast. Weather wise, I would say it was comparatively clear but there were certain sections with barely any visibility due to fog where we had to drive very very slow. As we reached Nashua and above towards Lincoln, the amber color of the early morning sun paired up with dense fog was reflecting on the trees giving it a beautiful color. 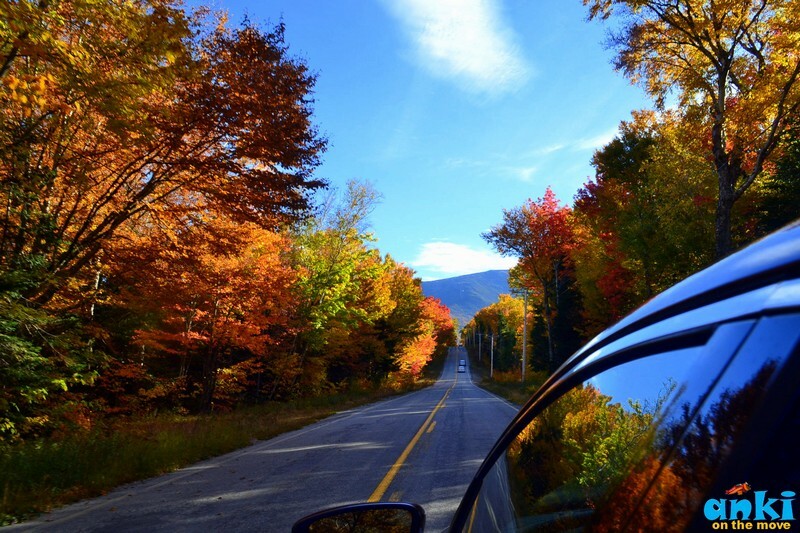 The crisp autumn of New Hampshire had always been famous and Columbus Day weekend where often peak fall foliage falls is jam packed every year. So much so that for the first time in my entire life, I saw 100% bookings a week prior. People plan this gateway for months in advance and come from several countries as we have fall foliage tracker that gives near accurate date for peak fall and if impromptu is your way of traveling, even in the form of Airbnb or Motels or Hostels, they were all booked in White Mountain region or the rare available ones were about 1.5 hours to 2 hours from the location which itself were filling up. Camping was available in a few campgrounds but it was cold to camp plus we didn't had appropriate winter gear i.e blankets, bedding etc to be used with tents .I love booking.com for its ease on free cancellation on many hotels and after ringing a lot of individual motels and airbnb’s and various cottages and cabins which weren’t vacant, I booked with Motel 6 on booking.com which was 1 hour 40 minutes away from Lincoln. I was continuously monitoring if there is anything that shows vacant which is nearer, luckily a day prior to my trip, 1 cottage at Holderness which was 30 minutes from Lincoln with occupancy of 5 came vacant and I booked as soon as possible cancelling my prior Motel 6. 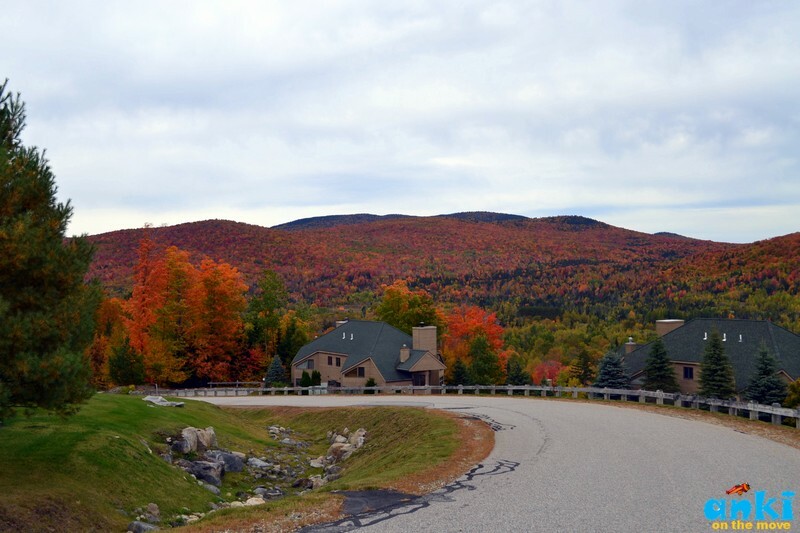 The best place to live in offseason or summer or early fall would be in white mountains or Bretton woods or Franconia Notch or twin mountains or Lincoln. If you go in weekdays you may find vacancy as many of the motels told us that for this weekend they have a minimum stay of 2 nights and also, Sunday - Monday was available in a rare few. However, due to peak tourist dates, the stay was twice expensive than usual. We liked our stay in White Oak Cottages they were $210 for 4 people 2 bedroom with kitchen and it had a pond at the back, it was clean, and it had a pool in the white oak premises which we didn’t use as it was cold. We even prepared our dinner with the groceries we had collected. The motel opposite says it has breakfast but we had our breakfast next day in Lincoln. As we got down at the Summit from the train, cold freezing weather hit us in high wind although the view was clear. We had come unprepared with only one jacket. The hands were freezing. 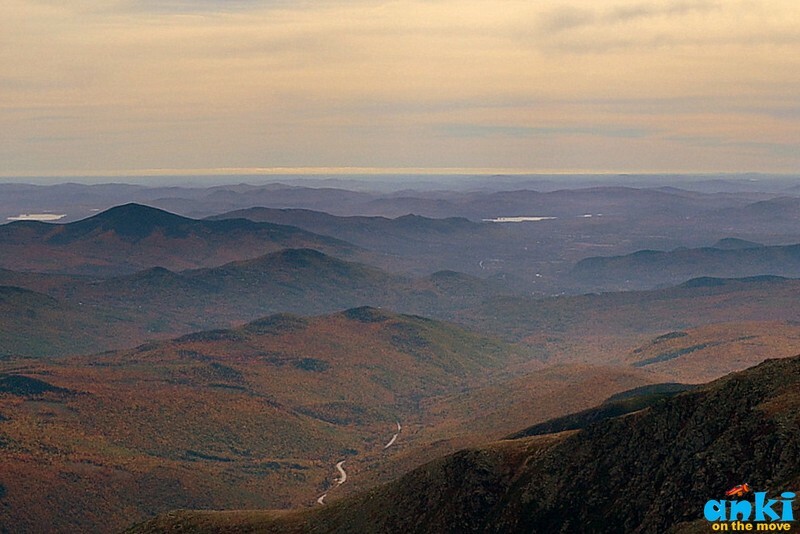 The view was not as clear that we could see the Atlantic Ocean but we could see long range of mountains and valleys and lakes all covered in brilliant fall colors. The change in weather from the base to the top of the mountain was drastic. We were lucky with the weather though as we weren’t kissed by fog. Often what we see with our naked eyes are incomparable to the depth of what our cameras can capture in a short while. Short because we just had an hour to explore before we board the return rail. Short also because, I don’t know about you, but I am often conflicted on should I enjoy the place through my own eyes, or should I let my camera enjoy it more. Sometimes you just let it be. 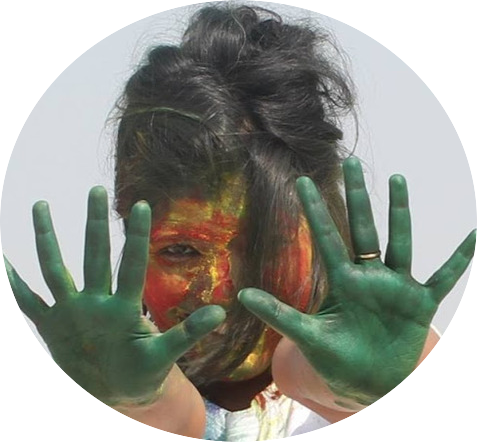 It was one of those times where colors were brighter than my eyes could reflect. It was bright red, bright yellow, bright orange and bright green. It felt like a painting. And it was everywhere. And I was overwhelmed on what to capture. 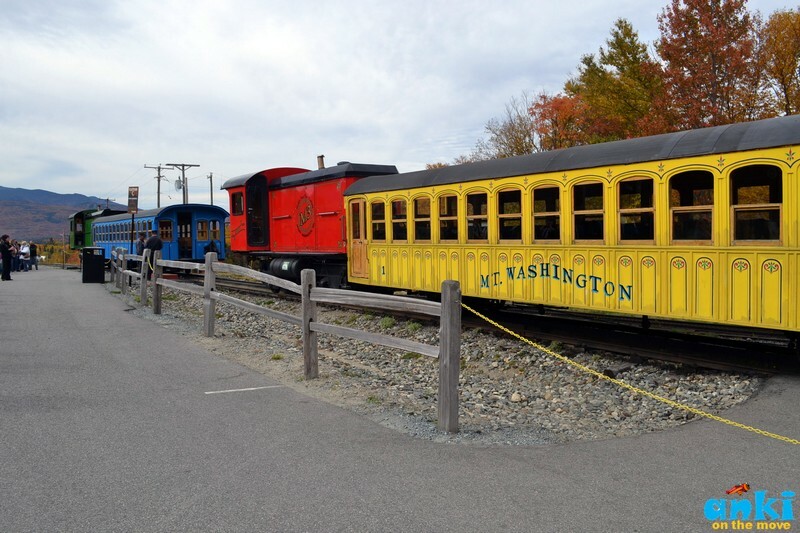 I had always wanted to experience the vintage steam historic locomotive cog railway in Mount Washington. However both slots of 8 am and 9 am were fully booked online. The smell of steam , the whistles of steam locomotive in chuck chuck with the colors of fall may have been way way more attractive than the eco-friendly diesel cog rail. 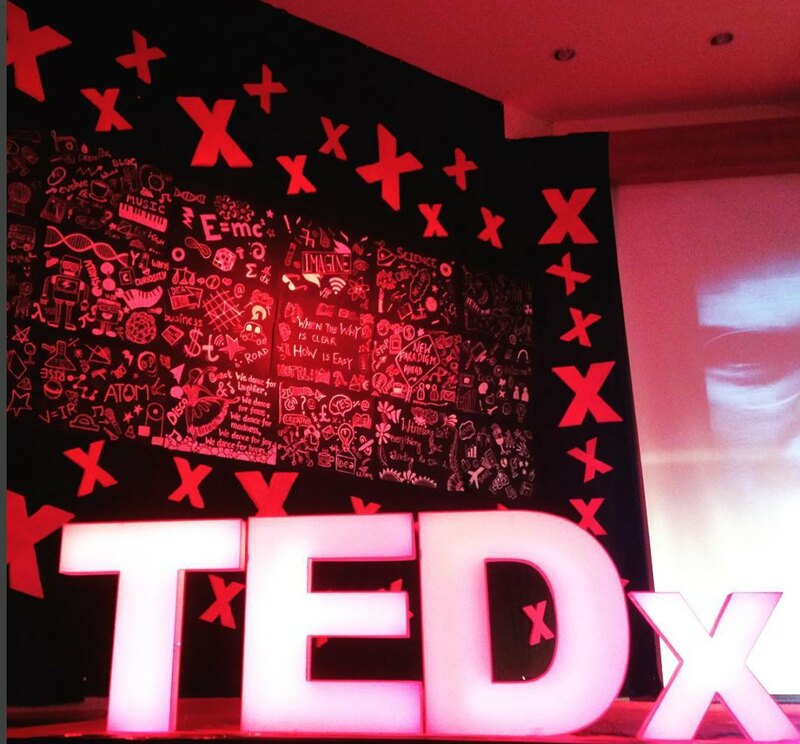 However , the experience still was one of its kind. Thankfully we had pre booked ticket for Diesel cog, as for that weekend, had we arrived impromptu there was no chance we could have gotten in the train before 1pm or even none. We had booked tickets 2 day prior online and it was showing few tickets for 9:30 am and then 10 , 11 , 12 were fully booked and a few slots in between till 4 was available. We chose the early slots, because usually in mountains, clouds start appearing post late afternoon. Weather.com had predictions of rain post lunch. Here in US, due to weather changes, everyone does road trips after checking weather.com. Not checking it might be a little foolish. Sometimes there are thunderstorms, sometimes, other natural weather changes which can delay your travel, so better check it. The railway is approximately 3 miles (4.8 km) long and ascends Mt. Washington's western slope beginning at an elevation of approximately 2,700 feet (820 m) above sea level and ending just short of the mountain's summit peak of 6,288 feet (1,917 m). The train ascends the mountain at 2.8 miles per hour (4.5 km/h) and descends at 4.6 mph (7.4 km/h). It is the second steepest railway in the world after Pilatus Railway in Switzerland with an average grade of over 25% and a maximum grade of 37.41%. You can check my post on Pilatus Cog Railway here . 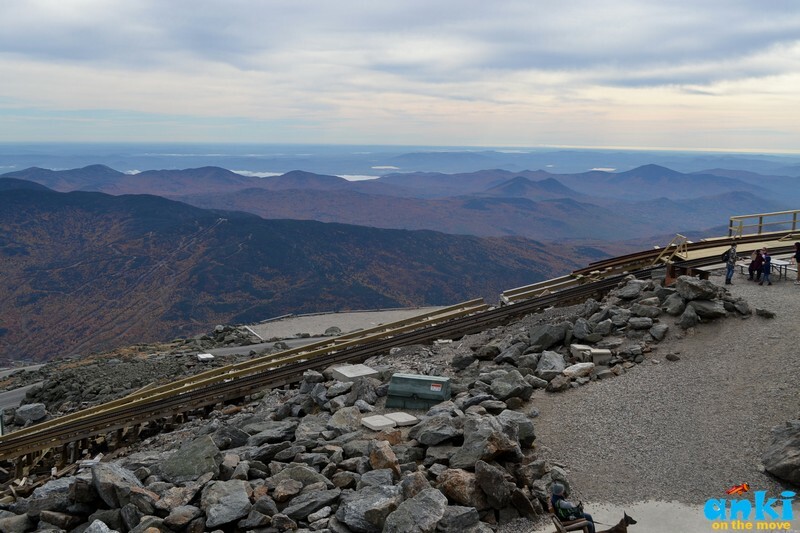 The guys here at Mount Washington say that Switzerland was jealous of our Cog Railway which was once the steepest and hence after a few years they developed their own Steepest Cog Mountain Railway. As we ascent above from the base, the view at our back starts getting bigger and better on our left. 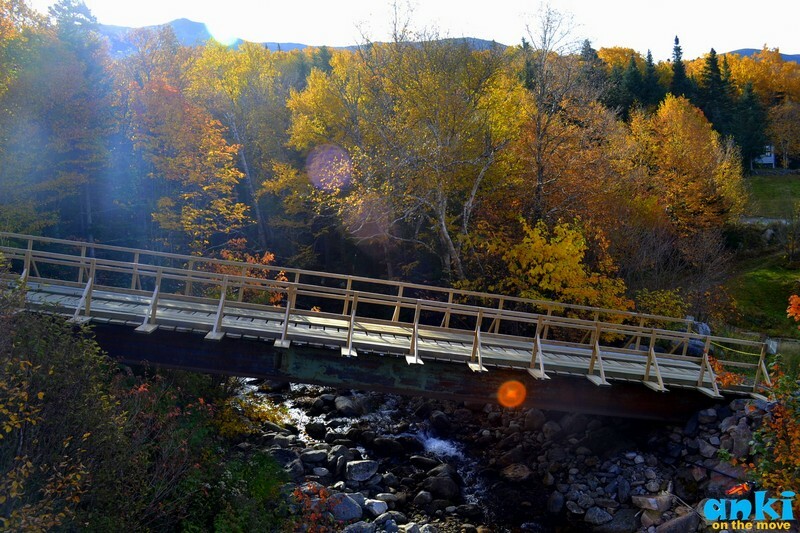 We see numerous valleys and mountains covered in fall foliage in peak fall. Hence while going up, sitting at the left side is important. But we couldn’t get left side because we reached by 9:20 with our drop off buggy that takes us from the parking to the rail station and people had occupied seats probably way before that. Arrive half an hour early to get seats specially on packed weekends. But we could stand up after some time, and click pictures. Note that it’ll be a little uneasy to stand up due to steepness under our feet but still me and a lot of us stood and took pictures from the view ahead. The windows can be opened from the seat. At the back there is a staff door, do not attempt to open that, as it may lead you to a fall that would be a long drop to the bottom. As you ascend up, to the summit, we took a mental note on how the trees change and we hadn’t even gone so far. From being bushy in fall colors to bare there was a difference and why because this region was struck with Avalanches ( 7 years back) and Hurricane Irene(5 years back) in the past that had left marks of scarring and mud slides and washed off trees. So as you ascend up, you would also see a moose on your left, and that moose is so sweet that it stays in the exact position on your way down. Well thats a statue of a moose, but it looks so real that I almost grabbed my camera only to be told that you would much likely see the moose on the access road that you came up this morning but wouldn’t see moose on the rocky mountain like this as the moose drinks a lot of water in a day.. When taking Road trips in New Hampshire you would see many markings with moose crossing! We weren’t as lucky to spot one live moose crossing in front of us, but still. 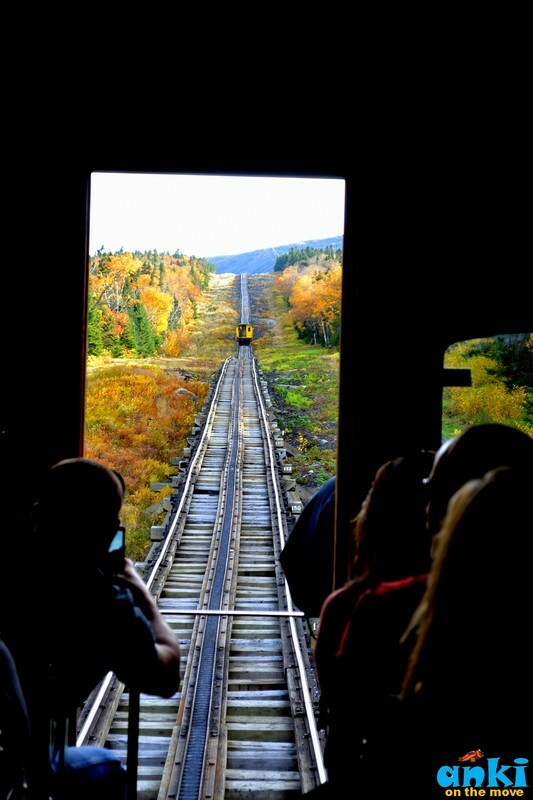 Cog Railway is a little expensive but the experience is totally worth it. Steam Cog Railway are for $75. 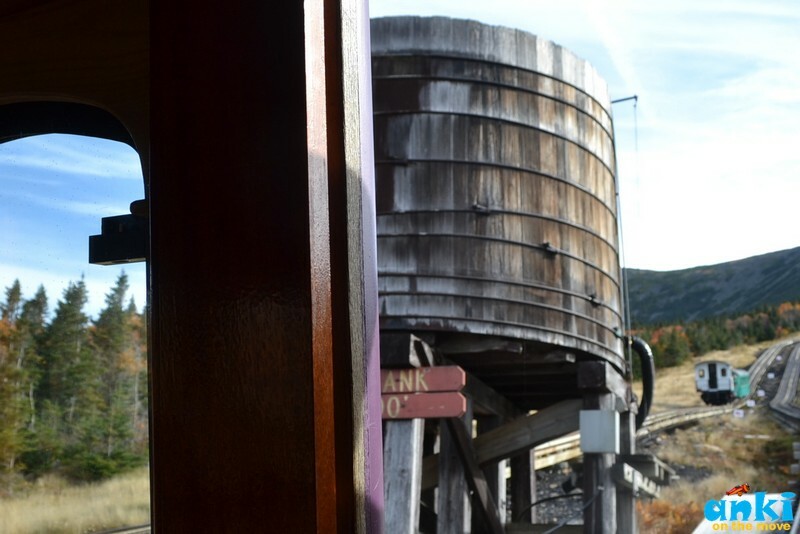 Diesel Cog Railway starts at $69. And at the prime time of 12 O’ clock we even saw the fare as $130. 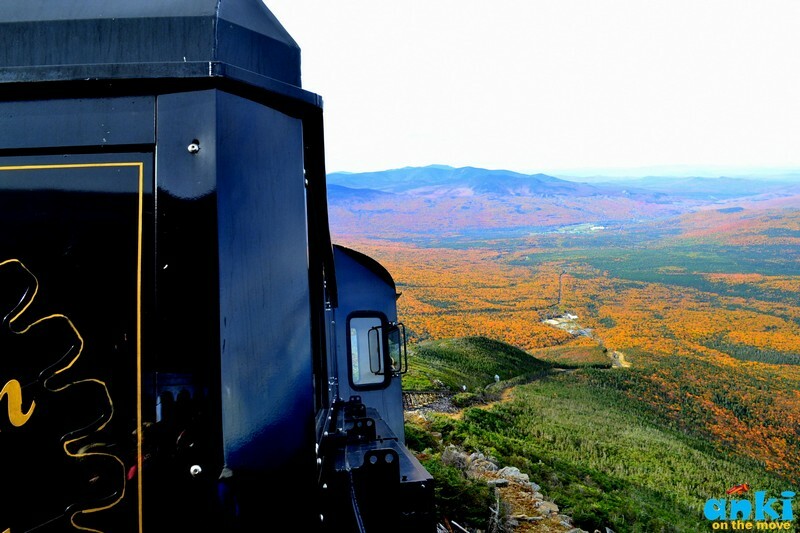 There is another Notch Train that runs from North Conway to Bretton Woods that too was sold out. At the Mount Washington summit we have Sherman Adams Visitors Center, Mount Washington Observatory's Weather Museum and 1853 Tip Top House. 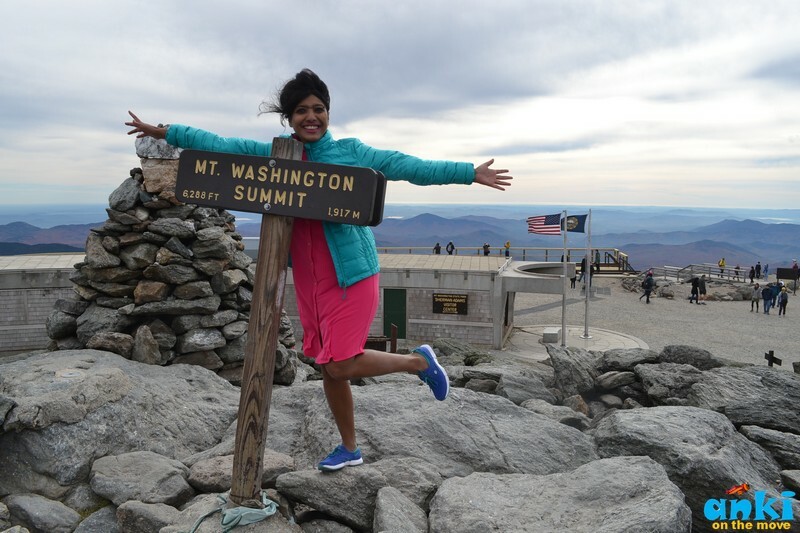 Visitors can send a postmarked stamp from the top of Mount Washington and get their photo taken at the summit marker. It’s cold there. So wear jackets and dress in layers. There is a restaurant at the base and a coffee place at top where we got hot chocolate. There are restrooms at the summit too. There are three gates, A B C. It means the train sequence one after the other. The first train would be train A, second would be B and third would be C when lined up going together one after the other. For coming down, stand in the queue on your respective gate. There is no such as a visible gate but the first line would be A, then B, then C. There would be announcement on return time based on your arrival at the summit. They would call like for 9:30 train passengers please depart. I wish we had flexibility to stay more and come back by any return train but that's not there. There are three popular ways to reach the summit. 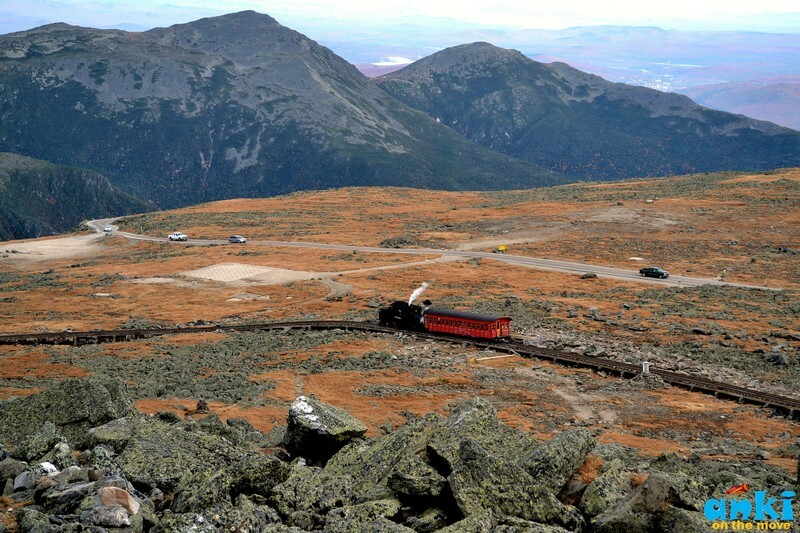 The Mount Washington Cog Railway ascends the western slope of the mountain, the Mount Washington Auto Road climbs to the summit from the east which is a drivable road (A lot of bikers and car owners drive up this road). 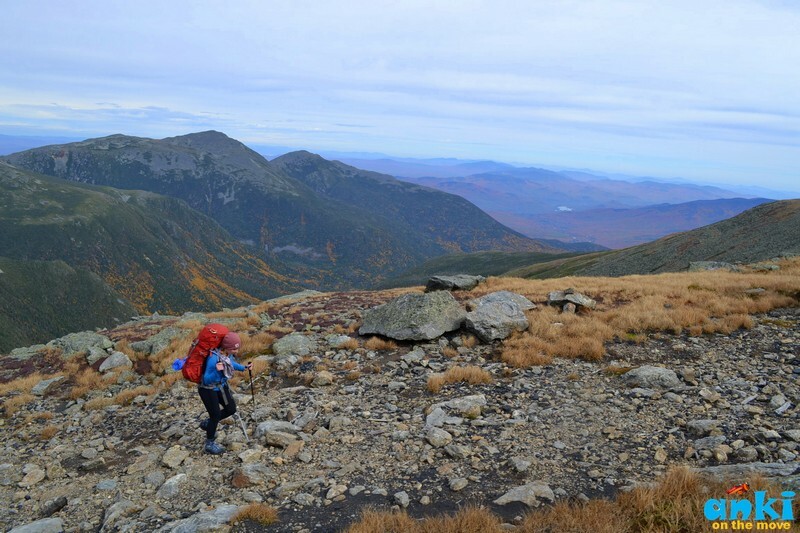 The mountain is popular with hikers as it passes the Appalachian trail. The folds in the rock that you see along the auto road(about 5 miles up from Cragway Springs) are evidence of the compression of the land of tectonic plates. The force of compression folded the rocks and uplifted the land into mountains. During the winter months the auto road is closed to the public, a snowcat is the only vehicle able to transport the observatory crew up and down. The steep ice slopes and hurricane winds can make it a trip of an adventure for them. The Cog railways runs from April till end of October and sometimes till November weather permitting. Other common activities include glider flying, and annual cycle and running races such as the Auto Road Bicycle Hillclimb and Road Race. 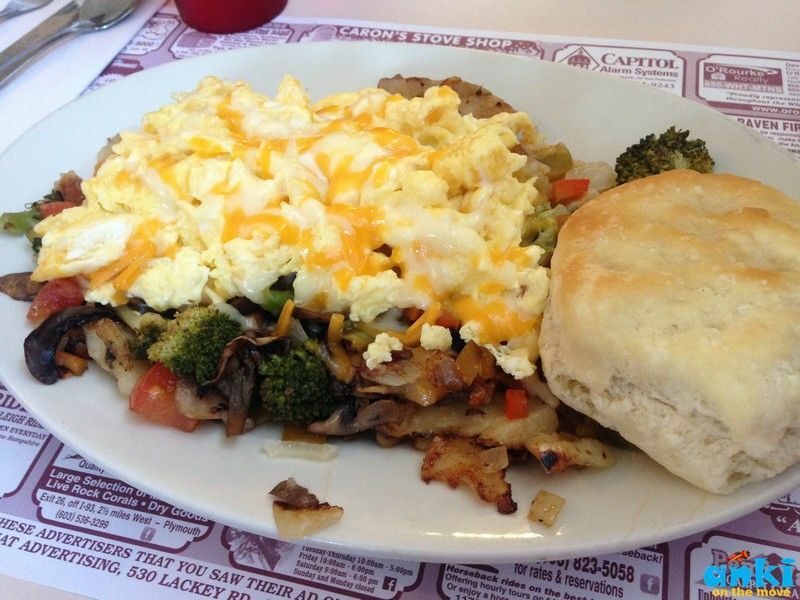 The best place to eat nearby would be Munroe’s Family Restaurant (opens at 7am) in Twin Mountains which comes 20 minutes before Cog Railway Station. That's also where we had our delicious breakfast as pancakes and omelets and they also have an exciting lunch menu. 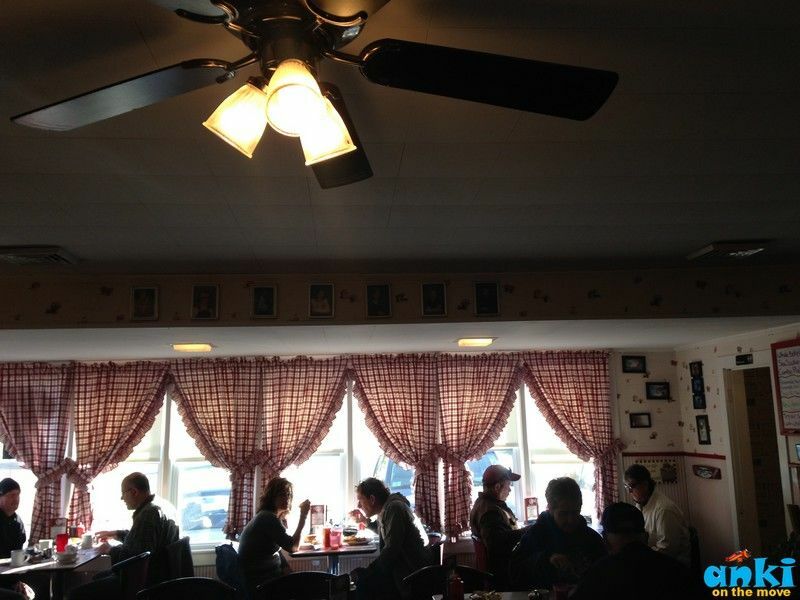 I highly recommend it for both breakfast and lunch if you happen to take the train similar to our timings i.e 9:30-12:30 as there aren't many restaurants between Bretton Woods to Franconia Notch. 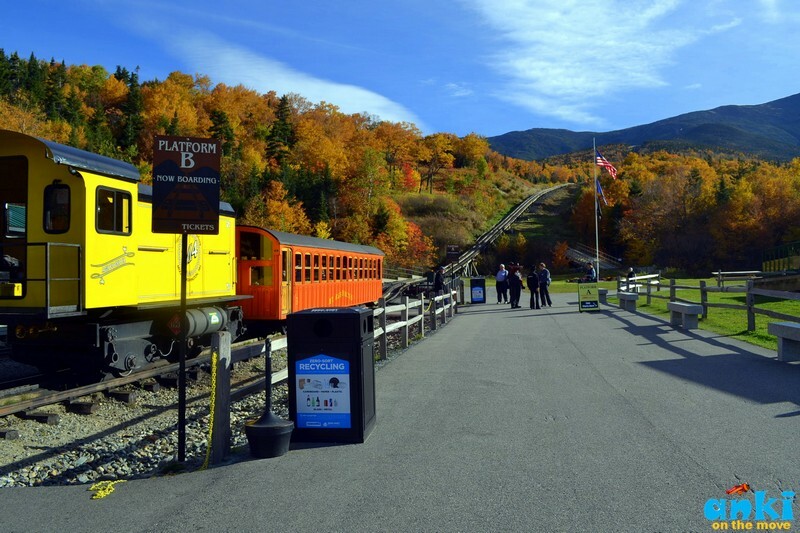 Cog Railway station is location at Base Station Road, Bretton Woods. 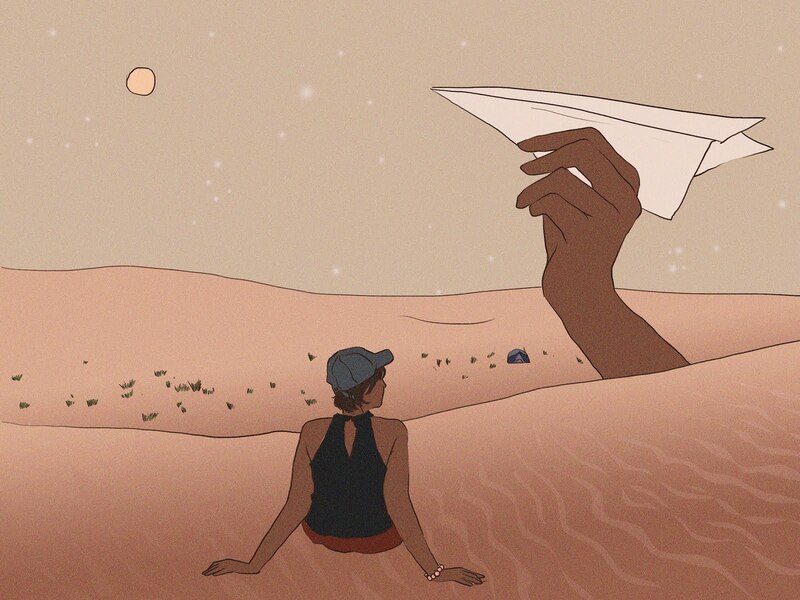 There is barely any Internet connectivity / network in the region. GPS however was working. But as a caution, please follow the directions as given on cog railway website as a slight deviation can take you to opposite end of the mountain. 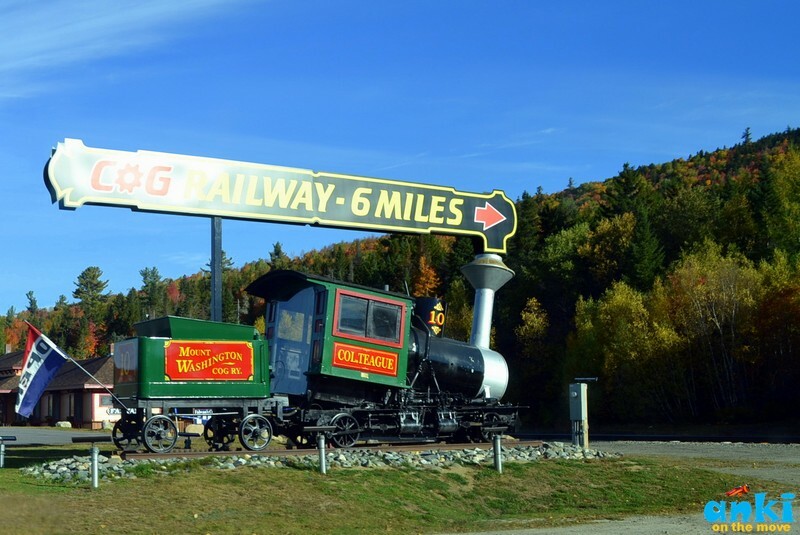 So how did the Cog Mountain Railway start? 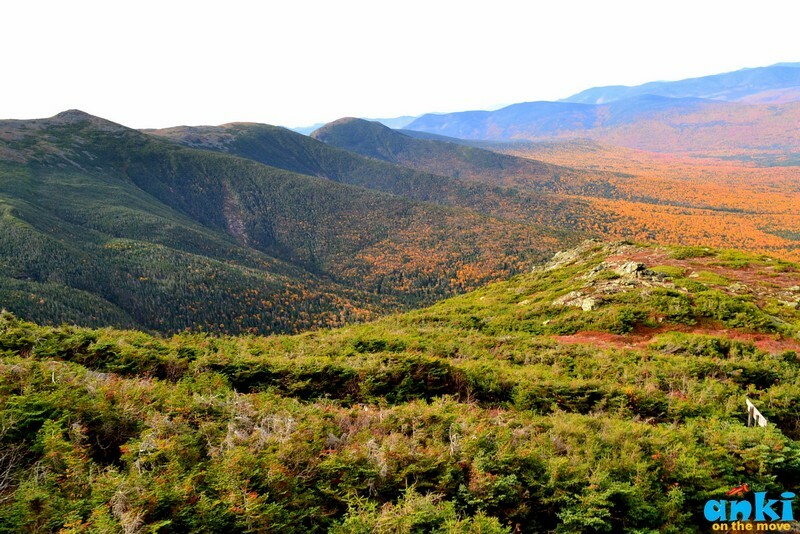 In December 1852, a man by the name of Sylvester Harsh hiked to Mount Washington. When he went there, the weather became very very bad, and he almost died on the way back coming from the mountain. Now when he got down, he thought that there must be a better way to experience the beauty and wilderness of the mountain. so Mr. Harsh made little money in a meat packing business in Chicago and he got interested in engineering and decided the plan the railways going up the mountain and in 1853 his plan was registered. 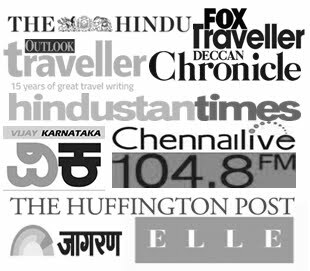 Initially he was ridiculed.. Then in next few years, they started beginning to seek investors, reviving the plan. in 1866, the construction began, took 3 years, and in 1869 made its first voyage up to the summit. 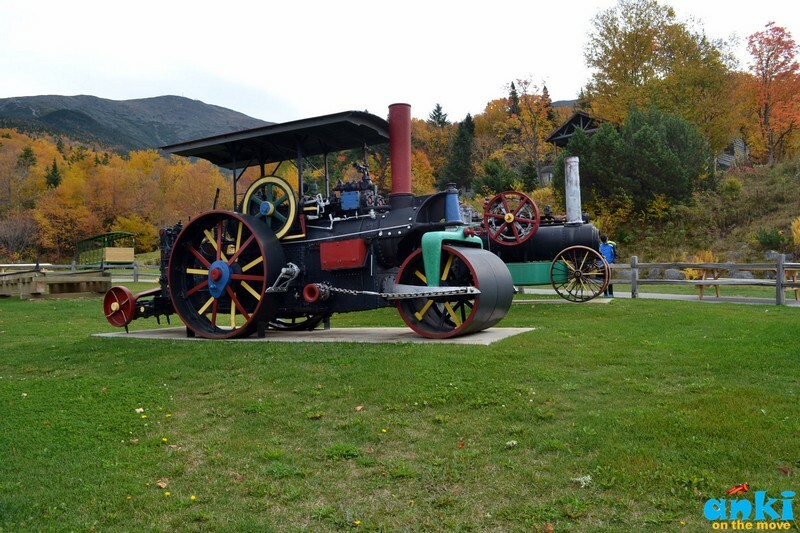 There is a memorabilia of The Cog at the Marshfield Station, where the original "Old Peppersass" engine is on display. Every activity of the running cogwheel today is tracked at the base station. They run through the summers, and in winters the employees become locomotive builders where they build locomotive, switches etc at the locomotive shop 200 yards below. 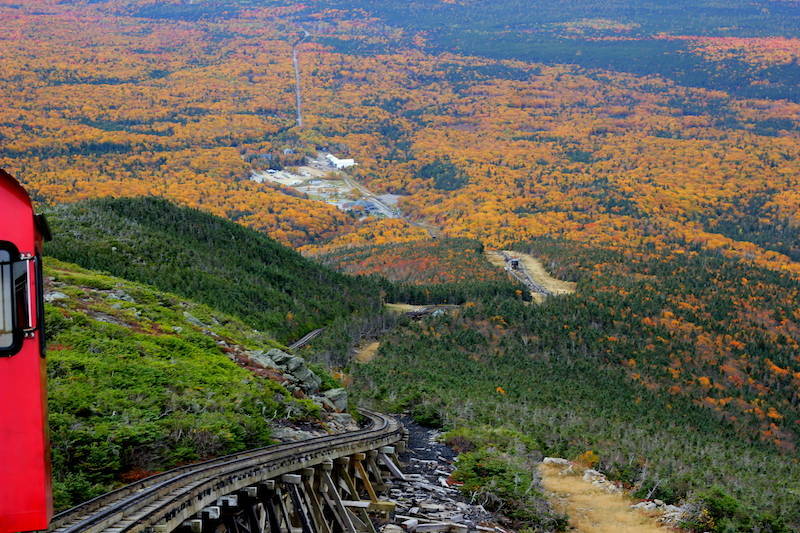 How Does Cog Mountain Railway Work? Think of it as a bicycle pedal pedaling the chain, so the chain here is called rack which we see in the middle of the track at the base and it runs all the way to the summit. As the bicycle has sprocket here they have cog which is much wider and just like in a bicycle pedal they have an engine. What engine does is it turns the cog which intern grabs the racks and that the locomotive to the mountains.60 gallons of biodiesel fuel is used in BioDiesel Cog. On the tracks there are numbers on the left and right which are very similar to the mile markers and they tell us where we are on the mountains. The numbers on the left had higher digital numbers, that meant it was main line track. The number on the right was lower digit numbers. In between our train journey, the train had stopped for our few seconds to let the engineers know that the track was lined and then we proceeded onto the main line track. 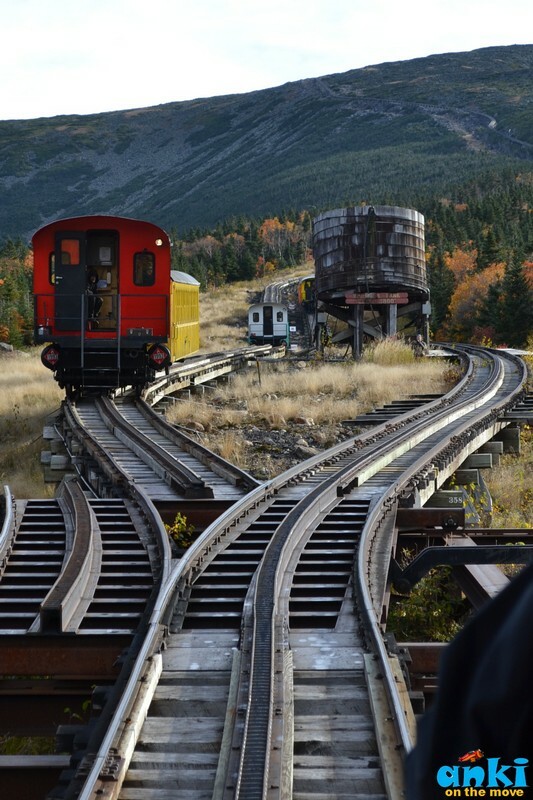 As our cog railway was coming down, we spotted a red mountain right in front of us. And each of us stared at each other? Shall we? We didn't know what place it was, but we randomly drove thereafter to places that were bushy red fall foliage. And we found Adventure Center Bretton Woods where we could zipline, take a canopy tour, lift rides and etc. Since we didn't had so much time, we just took some pictures at the hillock we walked on, and proceeded further.. However if you do have time do check them! A lot of motels / hotels closes mid October(Oct 15) or post Columbus Day(Oct 10) only to be opened next season but some remain open. 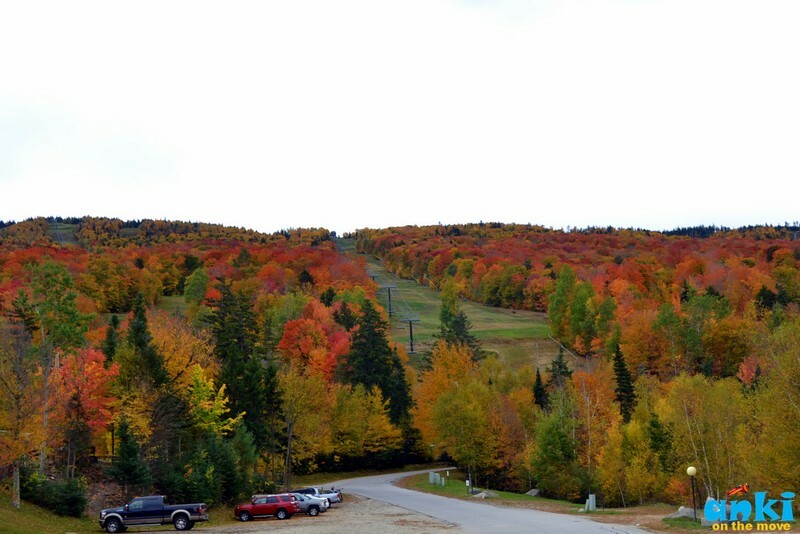 As per Foliage report, the fall is still going to be there this week till weekend although what we saw felt like peak but one can still take a chance! There aren't many travel videos on this region, I would be posting it very soon although it will be very short as we had very very limited time at each place. 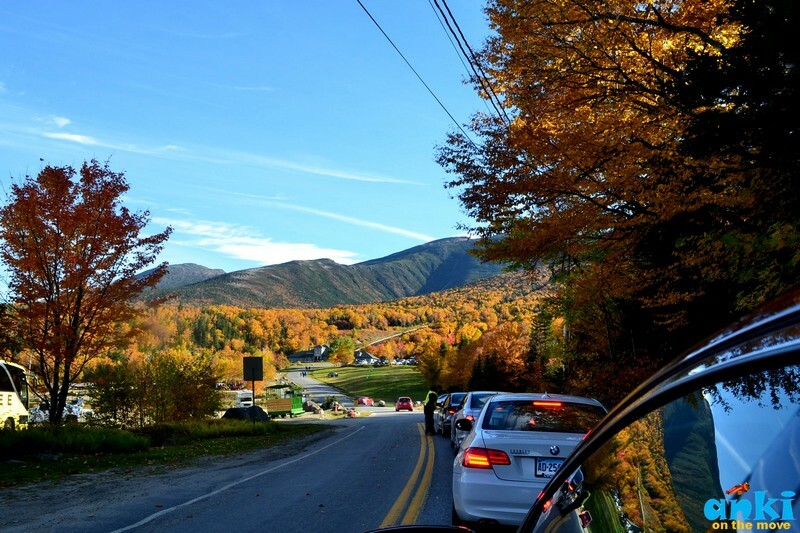 The next post is going to be about Lincoln, Franconia Notch and the iconic Kancamagus Highway! 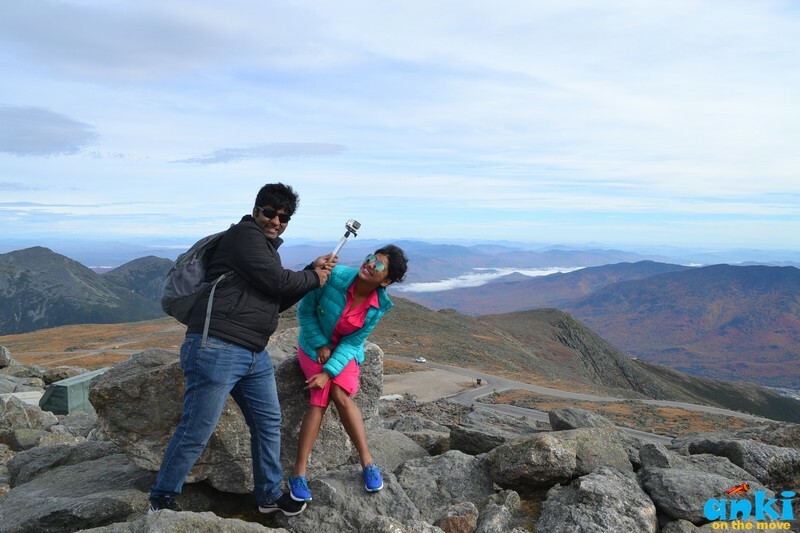 The vacation to White Mountains region must ideally be done in 3-4 days or more to enjoy it thoroughly. Wow, amazing pictures and well written post. 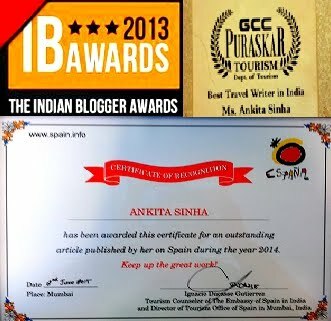 Thanks so much Arvind :) for your compliments.